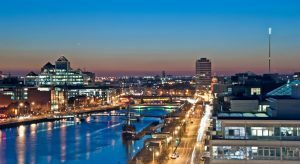 Are Dubliners becoming more a society of diners than drinkers? 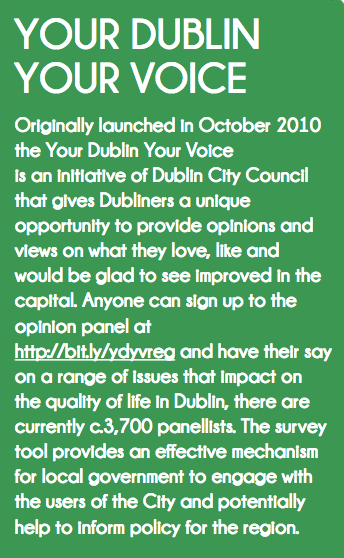 Results from the latest “Your Dublin Your Voice” suggests that we may be. The survey, conducted on the run up to Christmas, confirms the City’s love of socialising with both restaurants (92%) and pubs (91%) scoring highly on the enjoyment scale. The former benefits from having a good range of high quality restaurants which has improved over the years, while the latter suffers somewhat from an image of poor value. This is reflected in the fact that 20% more people say they dine out frequently (at least once a month) than go to the pub. By far the most important factor influencing people’s choice of where to shop is the variety of stores (77%) with value (66%) the second most cited factor. Only 4% indicate that technology is a factor although this doubles amongst 18-24 years-olds. That said 81% pay by tapping while 35% use click and collect facilities, so shoppers are embracing technology more than they realise. 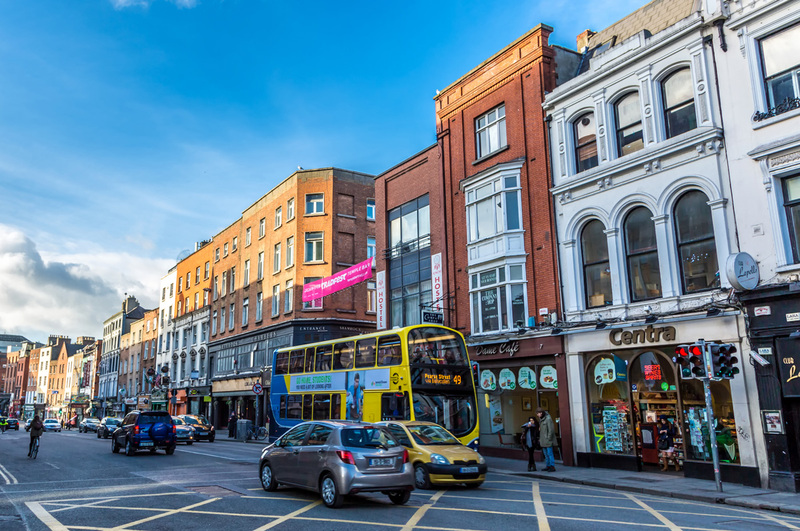 Grafton Street holds the most appeal of any area in Dublin with three quarters of those surveyed ranking it number 1. The George’s Street Vicinity (60%) showed strongly in second place, just ahead of Henry Street (57%). However, while George’s Street appeals to younger age groups, Henry Street’s appeal is skewed to the older demographic, reflecting the development of George’s Street as a social hub. Spending trends suggest that consumers are feeling confident with approximately 30% of people indicating that they are spending more on shopping and eating out in the last year. This falls to 18% for the pub. Encouragingly, the majority of people are not anticipating any change in their spending in the next 12 months. Public transport is vital with over half (53%) of all shoppers using it to access the City. Within this the bus is the most popular choice. The car lags behind at 24%. 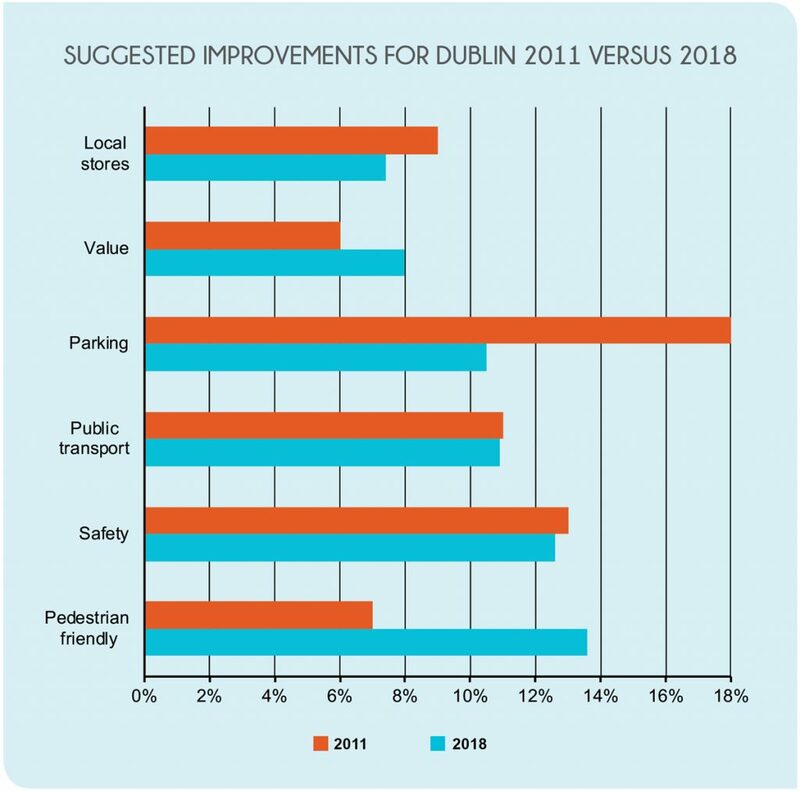 Indeed cars in general have lost ground since a similar survey in 2011 when parking issues topped suggestions for improving the shopping experience in Dublin. Now “more pedestrian friendly” is the top suggestion. 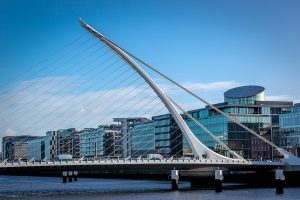 Overall, the survey showed that the impression of the City is positive with 89% agreeing that Dublin has a vibrant city centre. However, on the downside, while the majority still feel safe, some people are feeling less safe by day than in 2011 (from 76% to 72%). Interestingly, while only 40% feel safe in the city at night, this has not changed. The online threat does not appear to have materialised substantially yet amongst the shoppers surveyed. On average 30% of respondents never buy books, electronics or fashion items online. Meanwhile only 10% indicated that they frequently bought groceries online compared to 30% in the UK . What has caught on is Research Online Buy Offline (ROBO) with 55% people embracing this behaviour, a trend that has been seen globally for some time with Google reporting an 80% rate in 2011. There has been much discussion about the threat posed to traditional retail by technology. 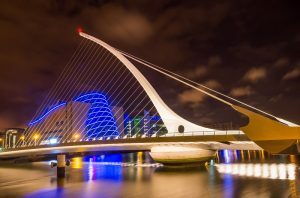 The relatively low online penetration rates in Dublin indicate that opportunities still exist. 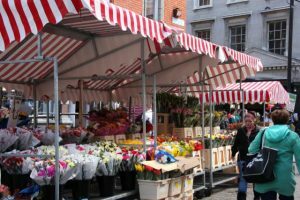 In addition, the survey shows that people still like to shop and socialise in areas which offer variety and value coupled with multiple dining options. This demand for “social shopping” will see innovative retailers thrive.